Let’s face it. We are a nation in pain. 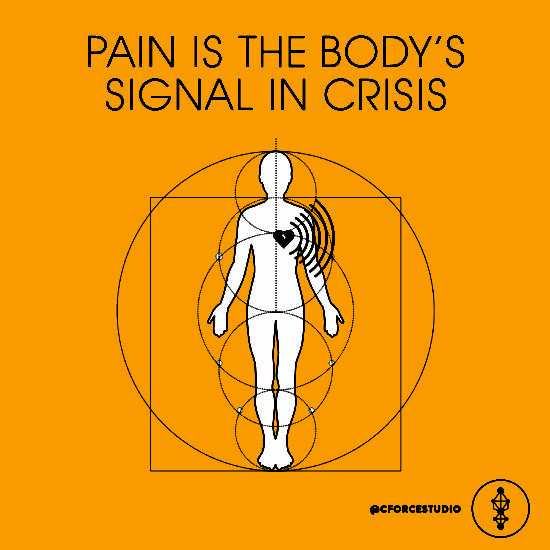 It is time we start to listen to the signal of pain transmitted from the body. As a physical therapist, I’ve discovered over the last 15 years that people in physical pain are in emotional pain. Traumatic memories are stored in the soft tissues of your body, not just your mind. This might be difficult for you to understand because medical care currently separates them. You see a physician/physical therapist for physical pain and a psychiatrist/psychologist for emotional pain. Fundamentally, health care and medical schools are not set up to treat the root of chronic pain, disease and addiction—catalyzed by emotional pain in the body. The only way to eradicate chronic pain is to move through it. I mean emotionally and physically move through the pain. Together, we must align your physical sensations of pain with your emotional experiences of pain – to allow you to safely open the door for your body story to emerge. Many years ago when I worked as a physical therapist in a busy orthopedic clinic, I noted past emotional experiences emerging when I would mobilize painful areas of the body. I used my hands and soft-tissue mobilization techniques to ease the muscles, joints and bones out of their recoiled, constricted states. Suddenly, my patients shared stories of a parent dying from a long-protracted illness, divorce betrayal, childhood trauma or sexual abuse. These body stories radiated signals of pain – shoulder pain, back pain, knee pain, migraine headaches and pelvic pain. Traditional physical therapy limited me from connecting the emotional pain to the physical pain due to method and time allotted with each patient. Of course, I endured my own pain-avoidance magnified each time I treated the pain of others. My personal relationship with pain guided me like a teacher. I learned pain could point me to invisible wounds – traumas erased from my conscious memory but remembered in my body for survival. I started listening to my own intuition – inner guidance that we all have but often ignore. I realized I needed to open my own practice – Centripetal Force Studio. I hung up my white coat. Yes, for a time I shelved my $150K education that did not teach me how to tune into the emotions of the body. I threw the rulebook of physical therapy out the window. I no longer used the traditional evaluation to diagnose pain in the body. I listened to my patients, their body stories and my own inner guidance. Each person moved me closer to understanding that their painful life experiences activated their physical pain and disease. Over time, I found that certain areas of the body consistently held certain types of emotional experiences. For example, shoulder pain was connected to old grief, broken-hearted wounds that still needed healing. Grief is one of those taboo emotions or conditions not socially acceptable, so often stuffed deep into the body that over time becomes toxic. But, what the mind choses not to deal with, the body will eventually expose. When you have a broken heart you go through life avoiding intimate experiences. Once we move through the stored pain, you are no longer limiting your life experiences. You are able to fully embrace them. I began to synthesize this new knowledge of the body with physical therapy. My sessions evolved from exercises to a quieter pace of listening and gentler movement of unraveling to the root – the body story. I invented a cross-manipulation technique that involved laying my patient’s body out in a cross on the treatment table. I gently massaged open the muscles and joints of the shoulders, chest, upper back and ribcage—often collapsed inward from a broken heart. I would then move to the lower back and hips to gently open the pelvis often rotated inward to protect itself. At times the stored traumatic memories were layered and knotted. It took time to untangle. The emotions that emerged were not always surrender of grief and tears, but also aggravated anger, fear, rage, shame and guilt. When the body was no longer holding these emotions all in, the release felt like a rebirth on the treatment table. I witnessed person after person feeling happier and more vibrant. They changed the course of their families, homes, relationships and careers to a more purpose-filled life. Numbing and medications used to suppress the pain became no longer necessary. Some patients turned down the last resort surgery. We would then rebuild with body-mind exercises – Pilates and Gyrotonic that focused on strength and rejuvenation. Pivotal moments confirmed I was on the right path. Ryan showed me that addiction is a mother wound, a broken heart, which could be healed. His family reports, Ryan is a walking miracle. Link to Ryan’s story below. Energy is emotions in motion in the body. Today, I have redefined physical therapy at Centripetal Force Studio to include healing the emotional pain that ails our bodies. The result is physical and energy therapy. Through my studio, hundreds of people have healed their bodies and lives. I’m grateful to them for sharing their body stories giving me infinitely greater knowledge to continue onward in this new frontier. Pain is your call to heal. Are you ready to listen? I invite you into the studio. In our time together, we will eradicate your pain. The energy in your body will no longer feel depleted or hyperactive. You will feel real balance and vitality within. Let’s rise together! Make an appointment with Gina Calderone, MPT, the Physical and Energetic Therapist, and Denise Carson, MS, the Body Journalist, to find and heal your body’s story. Im interested I’m in Bay Area in San Francisco I’m wondering where is your studio or if you have a place near where I live?